Went for his first month check up and Hep B (2nd dose) jab yesterday at KPJ Specialist. Current weight is 5.64kg and height is 57.5cm. Head circumference lupa nak catit... hehe.. The doc said, "In term of growth, he's doing very well. See the chart here. This is his statistic on the graph (pointing to the chart). Weight and height are both well above the normal line. Lagi sikit boleh jadi obese...hehehe"
I wanted to document this for keepsakes, just like what I did for Muhammad Daniel Hafiz. When we first arrived in Nottingham last year's April, I had discussed with Hubby, the plan to have a go at another baby. Kesian Daniel takde kawan.. 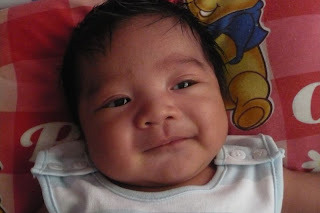 So, we had been trying, and alhamdulillah I got pregnant in October 2009. The experience while pregnant with Yusuf Firdaus differed from when I had Daniel Hafiz. And this time around, as you all have already known, Hubby was not by my side throughout the pregnancy. It WAS difficult. What with all the raging hormones, the loneliness and a 4-year old boy to manage. Many a time, I ended up by crying myself to my heart's content. Nevertheless, Allah is Great and Most Gracious. Like the previous pregnancy, I never had morning sickness. And this time around, I wasn't bugged by leg cramps at any time of the day, especially in the mornings when I woke up, unlike the previous pregnancy. With Daniel, I got the cramps almost every other morning, and Hubby was the one who helped to ease the pain. No Hubby, no cramps... I was very thankful for this. I have been experiencing brief moments of sadness for the past 2 weeks, they made me wonder what's wrong with me. The moments lasted just for a few seconds each time, but during that moments, I was totally washed by sadness, but I did not know what caused the sadness, and before I could delve into the matter, it disappeared..hehe... Maybe it's the sign of post-partum depression (PPD), or what the Malays call 'angin meroyan'? I have read through the definition of PPD in Wikipedia, but the symptoms are not the same. Could boredom be the cause? But I did not feel bored during confinement. In fact I am enjoying the relaxation and pampering at the moment. So, what is the problem? However, my present for today is a 39 deg C fever...duh... Got an antibiotic jab last night to lower down the temperature. Yusuf Firdaus also cried non-stop last night because of colic and by 2.30 am, I was totally drained of energy. Happy Anniversary, my dear Husband. 5 years maybe not that long. But I sure do hope that we'll get better together, and be blessed by Allah with more love, happiness and health so that we will be able to celebrate more anniversaries in the future. You, my dear Husband, Daniel Hafiz and Yusuf Firdaus have all completed my life. I love you with all my heart..
Kenapa orang awam yang hanya ingin membantu sesama manusia yang ditindas perlu diserang, dicederakan dan dibunuh? Kenapa perlu mencedera dan membunuh mereka yang tidak bersenjata dan tidak menyerang balas? Kenapa minda mereka terlalu kejam dan sadistik? Takkan tiada seorang pun di kalangan rakyat mereka yang berpelajaran, bertamadun dan berfikiran waras? Mereka tak terfikir ke yang tindakan mereka tu sungguh barbarik dan tidak bertamadun?